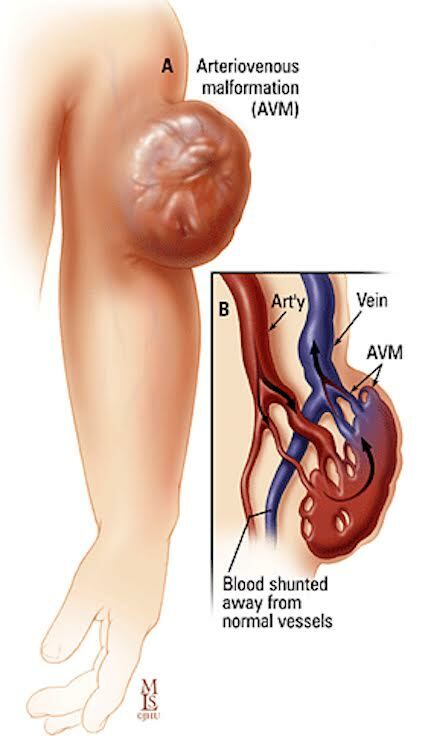 Vascular Malformation is a general term that includes congenital problems of the vascular system, which can include arteries, veins, or lymphatic channels. Venous malformations (VMs) may cause pain where ever they are located. 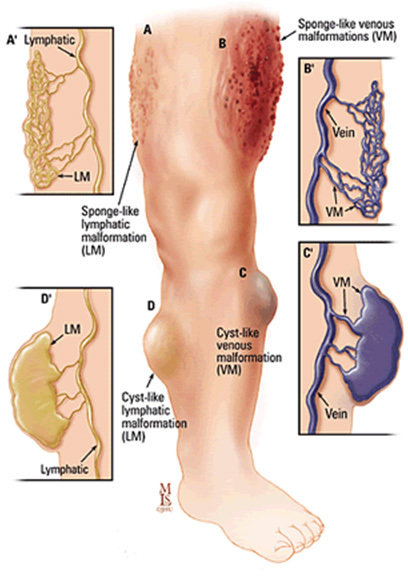 Venous and lymphatic malformations may cause a lump under the skin. There may be an overlying birthmark on the skin. Bleeding or lymph fluid leaking may occur from skin lesions. Lymphatic malformations tend to become infected, requiring repeated antibiotic treatments. Venous and lymphatic malformations may be associated with a syndrome called Klippel-Trenaunay Syndrome. Arteriovenous malformations (AVMs) may cause pain. They are also more stressful on the heart because of the rapid shunting of blood from arteries to veins. Depending on their location, they may also result in bleeding (for example from the bowels, from the uterus, from the bladder). They can even occur in the lung or brain, causing problems that range from heart failure to hemorrhage. Hemangioma is another common term used for vascular anomalies. However, this name actually applies to a childhood vascular anomaly that has a rapid growth phase between birth and 3 months of age. These often will resolve completely by age 7. The major reason for us to treat these is for low platelets that do not respond to medical treatment, or in the liver because of massive shunting with a strain on the heart. These can often be seen on physical examination. Deeper vascular malformations can be diagnosed on MRI (magnetic resonance imaging). While surgery is useful, it is usually difficult for surgeons to completely remove vascular malformations externally, as they will return if their source of blood supply is not removed completely. Typically, the ideal method to treat these lesions is to first cut off the blood supply with image-guided procedures, followed by surgery if necessary to remove residual parts of the lesion. Because these lesions are primarily a vascular problem, typically they will regress significantly when blood supply is cut off. Often, with modern minimally invasive techniques treatment is outpatient and the patient goes home afterwards for most lesions. The full shrinkage of these malformations may take four to six weeks. Most vascular malformations need several treatments several weeks apart to fully and completely seal and cure them but rarely needed major surgery. Most treatments are minor image guided procedures needing no overnight stay, and without scar or significant pain. All vascular malformations require long term surveillance, so that if there is any change, such as a growth spurt with puberty or pregnancy or menopause, they can be monitored for symptoms that may warrant rechecking and possibly retreating. Embolization techniques have been used extensively all over the world for the past 30 years. They have been well established for many years, and have proved invaluable in treating vascular malformations. However, since congenital vascular malformations are relatively rare, it is advisable to obtain treatment at a major center that sees many patients. The ideal treatment of vascular malformations requires a full team of specialists, including endovascular surgeons, neurosurgeons, head and neck surgeons, and plastic surgeons, all of which are on staff at NYC Surgical. We decide together what should be done for the ideal care of the patient and ultimately the safest and most effective result. Put your problem in the hands of specialists.